Cowboys and Aliens, it is without a doubt the title of the year and with Jon Favreau (Iron Man, Iron Man 2) directing, Daniel Craig and Harrison Ford starring and Damon Lindelof, Roberto Orci and Alex Kurtzman being three of the five screenwriters, it is also one of the most anticipated of the year. Can this genre mash-up provide the summer blockbuster thrills that many are expecting? The story focuses on Jake Lonergan (Daniel Craig) who wakes up in the Wild West with a mysterious device attached to this arm and his memory completely wiped. He ends up in the town of Absolution where he starts to learn more of his past, including his brush with brutal local tyrant Woodrow Dolarhyde (Harrison Ford) and his anarchic son Percy (Paul Dano) as well as the mysterious Ella (Olivia Wilde) then mysterious ships attack, people are kidnapped and the cowboys decide to go and rescue their folk from the clutches of those intergalactic demons. 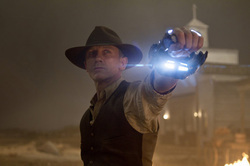 Cowboys and Aliens is not the film I was expecting it to be and probably not the film that many were expecting it to be. With its title and cast I expected Cowboys and Aliens to be a guilty pleasure type film in the vein of Piranha 3D, which doesn’t take itself too seriously and wallows in its B movie concept. However Cowboys and Aliens is much more of a western than a Sci-Fi and for the most part it is played completely straight. Therefore your enjoyment of Cowboys and Aliens rests on how much you are a fan of the western genre. The film is relatively humorless and does not contain the lightness that you would expect from a film with such a title and therefore when viewing the film you have to forget all expectations of what you expected the film to be and accept it on its own terms, as a serious western with some aliens. If you can get past the unexpected straight nature of the tone then what you find in Cowboys and Aliens is a surprisingly well-acted and visually interesting western. Daniel Craig is great in the lead role and perfectly fits the Western “Man with No Name” mould, with his rough, tough guy demeanor perfectly complimenting the look of an old west outlaw. The opening to the film, which serves as an introduction to his character is one of the high points of the film and perfectly introduces us to Craig and the film. Daniel Craig also surprisingly pulls off a sound U.S. accent and I would like to see more Westerns with him in the lead role. Harrison Ford also gives what is perhaps his best non Indiana Jones/Star Wars performance as Woodrow Dolarhyde and it is nice to see him play a villainous character due to him being cinematically type cast as a hero. Sam Rockwell is always brilliant and while he is great in all of his moments you wish that he were given more to do. To have an actor of Rockwell’s ability be playing a role of such insignificance just seems like a crushing waste of the talent at their disposal. Another supporting actor who shines in his scenes yet also should have had more to do is Paul Dano. It is the lack of screen time and material given to these two actors, which is one of the flaws with Cowboys and Aliens as it, is frustrating to see such talented actors given little to do in the larger scheme of the films narrative. This is made even more frustrating as Olivia Wilde is given a potentially interesting character yet is too much of a dull actress to really take it anywhere. The cinematography is done by Matthew Libatique (A frequent Aronofsky collaborator) and the films western landscapes look stunning and are reminiscent of the work Roger Deakins did on True Grit. The production design of the film is also great with the Western environments being thoroughly believable and interesting to look at. Speaking of the films western ness I actually found it to be a pleasant surprise rather than a flaw with the film and without giving away too much, I liked how the Sci-Fi played to the Western rather than the other way around, with the aliens motive being a Western rather than a science fiction motive. The science fiction in this film is only science fiction in appearance; there are aliens, ships and high tech weaponry but no ideas or concept behind any of it. It is not Minority Report or Blade Runner science fiction but then again this is not a science fiction film. The aliens themselves have a rather effective design while you are watching them but also a rather forgettable one. There are some tangible moments of threat when they are on screen however, with a scene in a turned over ship being reminiscent of Alien. Jon Favreau continues to improve as a director and this is arguably his most visually impressive film, with the action sequences also being surprisingly well handled. More could have been done with the story, concept and characters and some may come away from Cowboys and Aliens seeing it is a missed opportunity. There are also many obvious and predictable character pay offs and plot points, with the mysterious past of Craig’s character not adding up to very much. 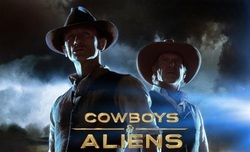 While there seems to be more negative than positive in this review, Cowboys and Aliens is a film that I very much enjoyed for what it was once I dropped my expectations of what I thought it was going to be. Overall while Cowboys and Aliens may seem to be too straight in tone for its own good and could do with perhaps a bit more humour, more memorable aliens, more of an interesting background for Craig, more material for Dano and Rockwell and less predictable moments, the film for what it is, is visually impressive, well acted and an enjoyable piece of summer entertainment which breathes new life into the western. Summary: Despite its flaws, Cowboys and Aliens is a gripping, well-shot and well-acted piece of summer entertainment, which although may not be the film it could have been is a surprisingly satisfying yet flawed film.